Faithpoint United Methodist Church was established in 2003, but the church is far more mature than many of its peers when it comes to online giving. 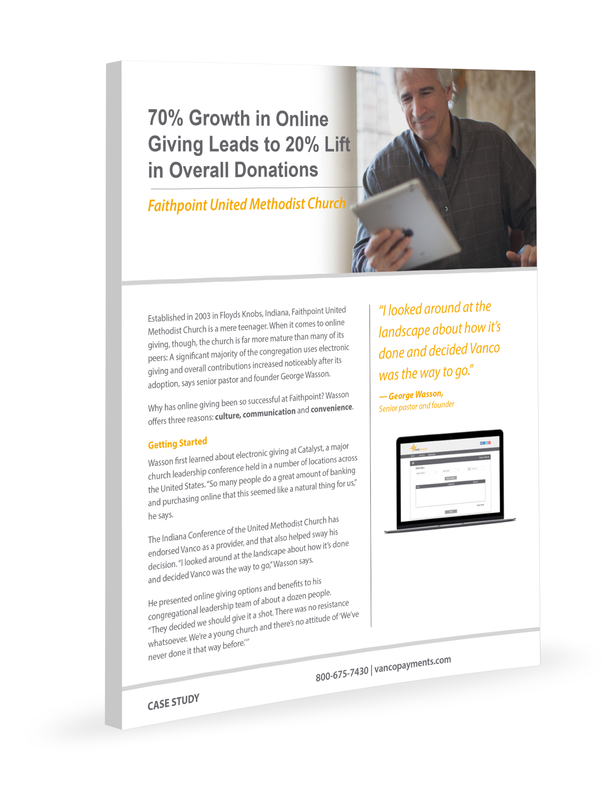 Why has online giving been so successful at Faithpoint? Senior pastor and founder George Wasson claims three reasons for their success: culture, communication and convenience. Buy-in from leadership, a culture of change and an ongoing communication plan have helped them reach 70 percent adoption. They've also seen a boost in overall donations and have been able to even out the ups and downs of the typical church budget. To learn more about how the church has thrived by leading its congregation to embrace e-Giving, simply provide your email address and download our case study, Faithpoint United Methodist Church: 70% Growth in Online Giving Leads to 20% Lift in Overall Donations.